Pittsburgh Underground: Announcement: Steel City Derby Demons Art Auction Fundraiser this Saturday! Announcement: Steel City Derby Demons Art Auction Fundraiser this Saturday! Hey all you roller boogers! The coolest chicks in the burg are at it again! 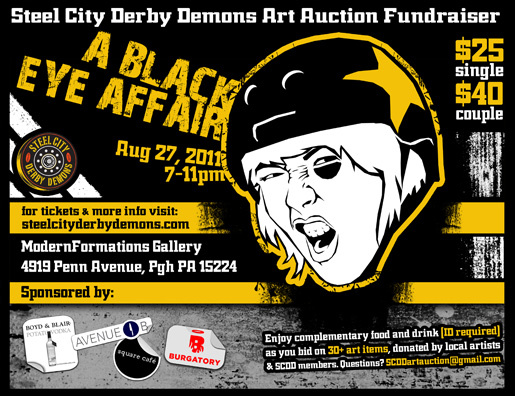 This time, The Steel City Derby Demons are holding a Black Eye Affair Art Auction Fundraiser this Saturday, August 27th. There will be 30+ art items to bid on, created and donated by local artists and Steel City Derby Demon skaters themselves. Food and beverages will be provided complimentary by our sponsors Boyd & Blair Vodka, Avenue B, Square Cafe, and Burgatory. Come and peruse our silent auction, enjoy some drinks and good food, and mingle with the ladies and gents of the SCDD! The event will take place at the Modern Formations Gallery at 4919 Penn Avenue, Pgh PA 15224 from 7pm to 11pm. Admission price is $26 per person, $40 per couple. Tickets are limited so nab your Art Auction Tickets here! ID will be required as complimentary alcohol will be served. For more info, email: SCDDartauction@gmail.com .